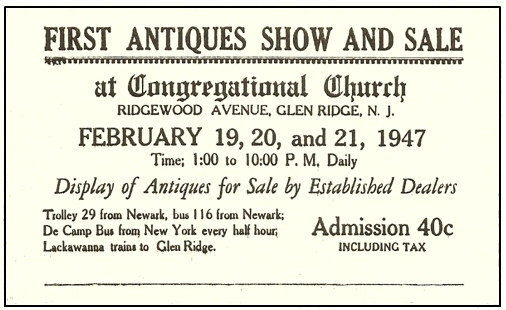 The Glen Ridge Antiques Show is one of the nation's longest running antiques shows. Opening in 1947, the show has been an annual Glen Ridge event ever since. Held in February every year, the show is a delightful escape from the mid-winter doldrums, providing an opportunity to see antiques collections in one convenient location, to share time with knowledgeable dealers and to learn more about life “back in the day.” It is always interesting to see how many of us who live a forward-looking metropolitan lifestyle are so intrigued by the crafting of these beautiful and quality objects made in the past. Click here for details about this year’s show. Every year, over 100 volunteers work for months to bring the show together for a good cause: proceeds are donated to a variety of charities serving people in need throughout Essex County, New Jersey. It all started with Muriel Butterworth’s and Peg Peacock’s love of collecting antiques. Muriel and Peg were members of the Glen Ridge Congregational Church’s Women’s Association back in the 1940s. They used to go shopping at B & W Antiques run by Duke Brady and Grover Williamson in the Doddtown section of East Orange. One day those gentlemen asked, “Why doesn’t your church have an Antiques Show? We will set it up for you.” Muriel and Peg approached the board of the church’s Women’s Association and gained approval with the stipulation that a manager would be found. Eldora Cole agreed to be the manager and her husband, Doug Cole, agreed to be treasurer. Logistics for the first show were very cozy by today’s standards. The dealers were in what is now the church’s kitchen dining area and two small rooms known as the Biddulph Room and the Rummage Room. This situation continued until Robinson Hall and the church school wing were built in the 1950s. A blizzard hit on the second day of the first show. Dealers’ and workers’ cars were blocked in on Clark Street and the snow was so deep the plows could not get through. The dealers that could not get out, stayed and helped shovel the snow. In spite of it all, at the end of the third day the show had earned a total profit of $600 – a lot of money at that time! When the Antiques Show first opened, food service was limited to soup, sandwiches, coffee and tea for the dealers and workers. As the show grew in size and reputation, it provided an opportunity for a new venture – the Antiques Show Luncheon – which was started in 1955. Cost to the general public was $1.00. Lunch was free for workers on duty when lunch was being served. All other workers and children of workers could have lunch for 50 cents. Obviously, this experiment proved to be a great success. We continue to gather in the kitchen to cook, eat and laugh and we now serve dinner on Friday night in addition to lunch. For many years workers in the kitchen were advised not to share the recipes for the excellent homemade dishes in order to keep these recipes exclusive to the Antiques Show. However, the secrecy was broken in 2000, when a book of Antiques Show menus, recipes and memories was produced. This book has now become a collector’s item itself! Over the course of its 70+-year history, the Glen Ridge Antiques Show has built a reputation for consistently producing a top-quality show drawing dealers and collectors from throughout the region. This show has come to represent the best in vintage furniture, art and collectibles to both the casual browser and the serious shopper. Over 1,000 people attend the show every year. Today, more than 30 established dealers from Pennsylvania, Maryland, Delaware, New Jersey, New York, Connecticut and Virginia bring a variety of antiques ranging from the traditional to those with a more modern aesthetic. David Cowell, a professor of political science at Drew University in Madison and owner of Lovely Living Antiques, has been with our show since 1984 offering a wide variety of furniture, china, glassware and primitives. For many years, we have arranged provided appraisal services for portable items or via photos for a small fee per item. This service, our own neighborhood “roadshow” pre-dating the PBS Antiques Roadshow, allows patrons to discover the history, age and value of their antiques in convenient and friendly surroundings. The lines at the appraisal table attest to the popularity of this service. As mentioned above, our food service includes delicious homemade lunches on both Friday and Saturday and dinner on Friday. Menu items from previous years have included Chicken Salad Sliders served with Homemade Chicken Corn Soup and Frosted Brownie Bites; the Waldorf Astoria's Famous Homemade Meatloaf, served with Creamy Macaroni and Cheese, Spinach and Strawberry Salad with Poppy Seed Dressing and Oatmeal Cookies; Chicken and Andouille Jambalaya served with a Baton Rouge Sensation Salad and Red Velvet Cupcakes. In addition to the meals, fresh, homemade baked goods, tea and coffee are for sale and served in Le Café during all show hours. The Women’s Association of the Glen Ridge Congregational Church is pleased to able to offer this remarkable Antiques Show year after year. There are many tasks and much hard work that goes into making the show a success. Here is a delightful ode to all our volunteer workers that was written by one of our former show managers. Our show date is near. Our props have been found. We can all claim a share!